This is an excavated ancient Roman silver Siliqua of emperor Honorius dating to 393 - 423 A.D.
VIRTVS ROMANORVM Roma seated left on cuirass, holding inverted spear & Victory on globe. 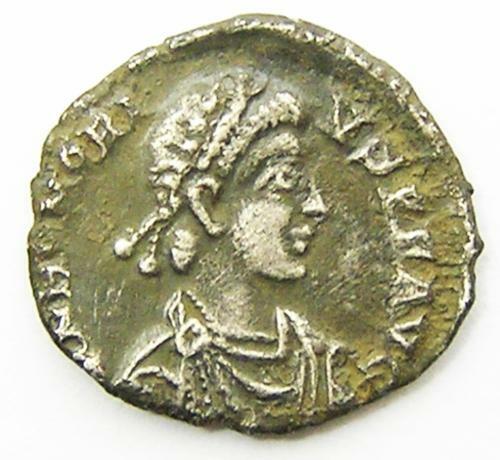 This coin was minted at Mediolanum (Milan, in Italy), mintmark MDPS. It had traveled across the Roman Empire, being discovered by a metal detectorist in far-flung Yorkshire! PROVENANCE: Found in Yorkshire. England.